Albuquerque-ALC is a nonprofit community-based organization providing adult educational services in under-served communities in Albuquerque. Our mission is to provide student-focused adult education and High School Equivalency (HSE) preparation in the underrepresented communities where our students live. We accomplish this by using individualized approaches to learning. Our vision is to foster an individual’s desire for education, opportunity, and independence. Our statement of integrity is to always remember that we serve a community of individuals and that our actions must always serve their needs. Our Adult Basic Education (ABE) program services includes Literacy and pre-HSE services. Our literacy services are supported through one-on-one tutor support as available through our community volunteers and/or referral to our literacy partners. Pre-HSE services include classroom instruction and one-on-one support from our community volunteers. Our High School Equivalency (HSE) Program includes HSE preparation and distance education for students at more advanced levels (9th grade level or above). As with our Pre-HSE classes, our HSE level students also receive classroom instruction with break-out sessions with a tutor to meet a student's individualized needs in the following areas: reading, language arts, math, science, and social studies,. Additional services include post-secondary education and employment transitional services in conjunction with our community partnerships. 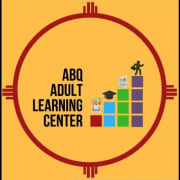 Would you recommend Albuquerque Adult Learning Center, Inc., dba, ABQ-ALC?